A little while back I wrote that we seem to be at the stage of our trip when our gear is beginning to fail.... During this past stretch, this trend seems to have accelerated, each day brings the need for another repair. Somehow this is fitting, as we have been passing many shrines here...dedicated to a local folk hero called 'Gauchito Gil'. These shrines are surrounded by red flags and an array of random (usually broken) items....from old bikes, to beer bottles, to Moto parts. The hope in leaving these items is that Gauchito Gil will help you out if you leave him an offering.... We are certainly starting to need a little help! Despite the broken items, we have had an incredible ride...camping all the time and enjoying all sorts of weather and ecosystems. We got a late start out of Salta. Argentinians tend to stay up late, and it is hard not to also stay up ..... Which inevitably translates to getting up later, but with the increasing heat we do need to try and break this pattern a little. 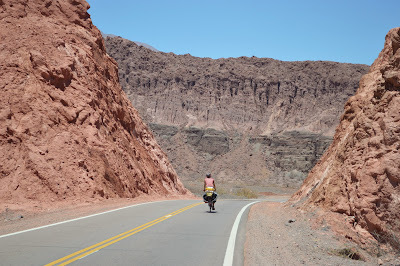 We bade farewell to our cycling friends in Salta, and hit the road towards the Quebrada de las Conchas and the town of Cafayate. About 20 km into the ride we hit a pretty sweet milestone: 22222km! We woke up and had some breakfast on the porch, then pushed off. The wind was not so cooperative today,and after we stopped for lunch in village of Alemania...it had become strong and in our face, so progress was slowed significantly. We eventually had enough and pulled off into the thorn tree forest that bordered the river. It had also become very hot, so we both sat in the shallow river for a little while :). I think that desert camping might be the most challenging kind of camping. There were many many bugs, and they seemed to be very excited to see us and all of the food that we had with us. This combined with strong gusts of wind, made cooking and eating a special kind of adventure. Once we got through dinner we zipped ourselves into our tent (also a special challenge, as the tent zippers are not so zippy anymore...). Unfortunately, even with the tent closed the wind seemed bring sand into every crack and crevice..... But, the wind eventually calmed and it was a quiet night (something that we have learned is like gold here in Argentina). Turned out our night at the hostel was not so restful, the owner decided to have a parilla (BBQ), and music and chatting went late....right outside our tent. We took off a little late, my front hub had started making noise...yet again.... So I decided to take it apart and check it out. Also, one of my very worn break pads fell out, so Glenn finally agreed that I could replace them! The weather was fairly nice in the morning, and the wind was helpful. We passed by the town of Quilmes where we had considered stopping to camp...but very loud music in the soccer field prompted us to carry on. We pedalled another five km and pulled into the desert, thorn tree forest. It was pretty hot at this point, and once again the strong winds made for an extra sandy situation. Once the winds died down in the evening we realized that we could still hear the music ....even at five km away! What was worse was the someone seemed to be playing with the volume...so it would rise and fall and random intervals.....making sleep rather difficult. After a not so restful night, we resolved to camp at least 15 km away from anywhere with electricity on Saturday nights from now on. We pedalled along a fairly rough road to the town of Amaicha del Valle and stopped at a gas station to use the wifi and get some supplies at the grocery store. We needed to make a decision about our route to Mendoza...most cyclists take the Ruta 40 which winds through small towns and through mainly desert scenery. After a couple of windy and sandy nights....we were craving a little greenery, so we decided to climb up over a 3000 m pass to the east side of the Andes. We realized that this would actually be our third time completely crossing the Andes. So we headed off up the mountain. At first the wind was quite favourable, helping us up some steep climbing. We stopped for lunch in front of a church, that had a bit of shade and a water tap. Just as we were putting together some sandwiches, a guy pulled upon a motorcycle and motioned us over. He told us that we had to leave because there was a law that no one could be on the church property. This seemed completely ridiculous, so we started asking for clarification...he just kept repeating that there was a law that we could not be there. Not wanting to move, I used a strategy that usually works....talking really fast, in bad Spanish, explaining we were tired and hot and just needed to rest, and saying please a lot. The most important part of the strategy is to keep talking until the person you're trying to convince let's you have what you want....mainly, they just want you to stop talking ! Anyways, he left us alone and we were able to finish our lunch in peace. When we got back on our bikes and turned a corner towards the pass we realized that the wind was coming straight over the pass....Fiercely. It was kind of humorous at first.....then it was nuts. Huge gusts, steep drops offs, and clouds of sand and gravel being blown in our faces. We both actually had to resort to walking for a while, and had to stop completely every few minutes when were hit with the sandpaper wind. Progress was slow! We also did not have a lot of water....we knew there was a natural water source ahead, but it was still 9 km uphill into the wind, and at the pace we were going it would take a very long time. We didn't have much choice but to carry on, and luckily we found another stream in about 4 km, and a little spot for the tent. As if to make the day especially challenging...when I tried to pump our stove (which uses liquid fuel that needs to be pressurized), I found the pump was completely broken. It turned out the seal had become stretched...after several attempts to fix the issue we finally came up with the idea to use a bike patch together with the old seal...a little tricky to explain, but all that matters, really, is that it worked...and we could have dinner! The strong winds persisted through the night, and I didn't sleep too well, yet again, because the tent was flapping around. But at least we had food and water! Still windy in the morning, but a little calmer. We had some food and took down camp, and carried our stuff back to the road. It was about 15 km more to the summit, and thankfully the wind was no longer in our faces...it was even a little helpful. As we climbed higher, things were chilly and looking a lot like Bolivia. It was refreshing after the desert heat, but we knew were were headed for more hot times. After the summit we had an awesome descent into the town of Tafi del Valle. We had some lunch there, and then rode alongside a beautiful lake before descending even more along the Quebrada de las Sosa. This may have been one of the most beautiful descents of the trip....so so green, and a beautiful clear river all the way down. We were making good time, but we wanted to camp beside the river before we got to the bottom. Because the setting was so idyllic, we wanted also wanted to find the perfect spot....which ended taking a while. Our first option was a picnic area, beautiful ....but it had an odd smell...was it poo or dead fish...no it was an enormous rotting cow carcas being swarmed with flies. We moved on, the second option was OK...but filled with a lot of fresh cow and horse poo. We moved on again, and finally found a lovely place. Just enough space for the tent and big rocks made pools of water, perfect for a swim and a much needed wash up. I also discovered that night that one of the hooks on my one Ortlieb pannier had broken.... It was just not a match for the Peruvian rack! It was finally a peaceful nights sleep. We took off from our paradise-like camp spot and continued our descent. We finally arrived at the bottom ....300 m, the lowest we have been since the Peruvian Coast! The stopped in the town of Monteros and got some supplies, we met some friendly folks including Jorge who had made a chopper bicycle and let Glenn give it a spin....turned out to be very different than a touring bike! We pushed off, and rode fast through farm country, with a tailwind. We stopped when we saw a sign advertising bike repairs, and the mechanic put a washer in to try to help out my hub problem, but he seemed just as clueless as we were as to what the problem was. We actually had a little trouble finding a camp spot, this is not a tourist route in the least and with mostly farm land there were not many hidden spots. But finally, after quite a long day we found a dirt track going alongside a river, and a great camping spot at the end. It was another quiet night as well. We took off down the road, and had more flattish riding and farm fields in every direction. There was a slight uphill grade, but a nice wind to help us out. We had a bit of a climb before the town of Catamarca, up to 1200 m (about a 900m elevation gain). We did part of it before turning towards the village of La Vina. It was mid afternoon and very hot, some were glad to get out of the sun. We asked around and people pointed us to the river were there were some picnic tables, and said we could camp there. There was also a shop/bar next to the tables and they kindly gave us some ice cold drinking water. We tried to stay cool in the afternoon, and then we made some supper. Then, loud music started coming from the bar....we got a little worried about sleeping, so Glenn asked the owner how late the music would be on for....she told him midnight or so. After cleaning up from dinner, we decided to find somewhere a little quieter to set up our tent. We had noticed that the church had a big lawn, so we asked around and everyone said it would be fine for us to camp there .... It was a super friendly town, that does not see a lot of visitors. We ended up having yet another peaceful night....if we are not careful we might get used to this.... We headed off to finish up the climb, it was actually quite easy, and not too steep....and once over the top we were descending almost all the way to Catamarca. Quickly at first, then more gradually with a tailwind! But...it got hotter and hotter. When we got to the outskirts of town we stopped for a cold drink, and our thermometer read 42 degrees Celcius.... Really f****** hot. We pushed on, and saw a remarkable number of cyclists out riding in the heat...good for them! Then all of a sudden my tire went very flat very fast. We found that my rim tape is wearing out and one of the places where the spokes attaches to the rim was exposed and sharp, causing a big rip in the tube (yet another thing falling apart! ), we patched, hoping that the thicker rubber of the patch would hold up against the sharp area. We found the tourist office in town and they pointed us to a couple of hostels. While I was in one getting prices, my tire became flat again!! Same issue, so we re-patched it,and also added some medical tape to the rim. We finally settled on a place to stay....and spent the evening melting in the heat and drinking cold water. From here we continue our journey towards Mendoza, it should take us another two weeks or so. And if all goes as planned, it looks like we will be meeting my dad there....so we are super excited!